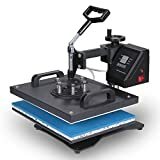 Hotronix Fusion 16"x20" Heat Press Swing-Away MADE IN USA - Heat Transfer Press Machine Built To Last! Hotronix 16x16" Heat Press Auto Open MADE IN USA - Heat Transfer Press Machine Built To Last! Who does not like a t-shirt with a customized print? We bet everyone does, and that is perhaps what has made heat press machines gain popularity over time. Not long ago, people used to rely on traditional ironing-on methods to create customized prints. However, that method has long been discarded, as many artists have realized that heat press machines print faster and are versatile. The versatility of the heat press machine is due to the fact that they have several attachments including cap, mug, and hat attachments. In addition, these machines use high temperatures to embed prints, and this enables them to give permanent results. Already interested in one? 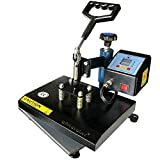 Check out the following top 10 best heat press machines in 2019 reviews. The Hotronix 16”x20” Heat Press Machine has a lot of features that make it one of the best on the market. One main feature is the heat platen, which measures 16” by 20” and opens effortlessly with swing or draw motion. Another feature is the special cast aluminum frame, which offers unwavering durability. The thickness of the platen is 3/4”; hence, expect it to retain heat perfectly. This heat press machine also has 4-hour sleep mode to help save energy. It comes with a 1-year warranty on parts and labor, 2-year warranty on circuitry board, and a generous 5-year warranty on major components. If you find the first product too pricey to buy, you can try out the ePhotoinc 1515GB Heat Press Machine. It is affordably priced yet it works just like any other powerful machine. It uses 110 volts and delivers 1400 watts of power. Additionally, its size is 15-by-15 inches, which is simply perfect. The machine also has an LCD display to show you the time and temperature. Talking of temperature; the ePhotoinc 1515GB model requires a high temperature up to 500 degrees Fahrenheit to work properly. It arrives assembled and great for T-shirts, mouse mats, bags, and garments, among others. The ePhotoinc 1515GB model made it to this list because of the price. The F2C 5 in 1 Machine, on the other hand, has made it to this same list because of its non-stick surface. 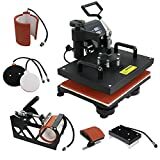 Well, apart from being non-stick, the surface is equipped with a detached upgraded aluminum cradle to let you use the heat press machine for your custom mugs, pads, and hats, among others. Another feature that has impressed us in this machine is the full 360-degree rotation swing-away design. It is professional, and, therefore, delivers great results. This machine is not just 5 in 1 but also it comes with a 2-in-1 digital controller to give you amazing performance on a consistent basis. It comes with all the essential attachments that include one hat press, one mug press, and two plate presses. Well, considering its versatile design, the machine is ideal for caps, T-shirts, coasters, jigsaw puzzles, ceramic plates, tiles, mugs, and many more. It is a heavy-duty and commercial grade, so it can give consistent results every time it is used. Moreover, its hat press measures 6-by-3 inches and its t-shirt press measures 12-by-15 inches. Everyone wants a heat press machine that offers professional results and is easy to operate. Well, that’s exactly what this heat press machine offers. It is the unit to go for if you want to make t-shirts for your clients or family. It is heavy and requires a high temperature of between 350 and 400 degrees Fahrenheit to embed the design onto the material permanently. Moreover, this machine offers uniform temperature, pressure, and even boasts industrial strength to further deliver peerless performance. Considering how this unit is designed, we are certain that it will give you the results you want. Hotronix is liked across the globe because they take their work seriously. For example, they have made sure that this auto open heat press machine is approved by UL, CE, and ULC. That being said, you will have peace of mind using the machine. What’s more, they have gone an extra mile to equip the heat press machine with a leveraged handle for effortless closing as well as a wide opening for easy layout. They have also included the sleep mode to enable the machine to conserve energy. This machine is brand new, and that means there is no way we could have left it out of these reviews. It comes with a heat press of 15-by-15 inches, and this is simply the perfect size to embed your t-shirt with any image you want. In addition, the pressure of this digital heat press is adjustable, so you can get the best results without trying so hard. Plus there is a silicon-gel baseboard that is a good conductor of heat. The temperature range of this unit is from 0 – 699 degrees Fahrenheit and the time ranges from 0 – 999 seconds. ePhotoinc is another manufacturer that is dedicated to doing good. For this reason, they have equipped this 9 x 12 heat press machine with all essential features. They have equipped it with the latest digital Led Temperature & Time Display Controller to make sure you know the temperature you are working at. They have also equipped the heating element with the Teflon-coated non-stick surface to prevent scorching of transfers. The heat press machine arrives fully assembled, meaning you will be able to use it right out of the box. With a 12-inch by 15-inch surface, this heat press machine offers a large area to create your own custom t-shirts. 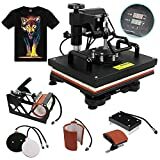 It is a 5-in-1 multifunction heat press machine that comes with plate, hat and mug attachments to let you create virtually anything you need on your t-shirt. In addition, it is equipped with a digital LED controller to make it easy to operate. It also features a non-stick surface that comes with a detached upgraded aluminum alloy cradle for use of the hats, pads, and mugs elements. The individual safety control chip of this heat press machine allows it to accurately control the plate heat on the setting degree. Also, there is an LCD Control Board that displays temperature with a range of 0 – 750 degrees Fahrenheit and time with a range of 0 – 999 seconds. Another feature that stands out is the Teflon-coated heating plate, which eliminates the need for coated sheet since it is harmless to the cloth and convenient to clean. The unit requires 1800 watts of power and uses voltage of 110 volts. A heat press machine is a symbol of modern technology. These machines are miles ahead of the traditional ironing-on methods. They print t-shirts, mugs, hats, and caps faster than conventional methods. They are also versatile and are easy to operate. Although their prices are much higher, they are worth it. So, grab yours today and start creating custom t-shirts for family and/or clients.